Double breasted jacket with welted breast pockets, self fabric belt and belt carriers. 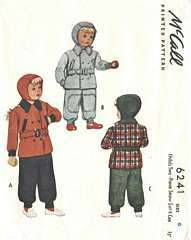 Pants have attached bib and suspenders and button closures on each side. Childs Size 6; Chest 24; Waist 22. Pattern is cut and complete. Envelope has light edge wear; overall very nice condition.